These buttery brown sugar cookies are shortbread-like cookies made with only 5 ingredients. These are excellent cookies to bake for a special occasion or everyday treat, and they are egg-free. They're delicious with only the chopped pecans for flavor and crunch, but there are many other variations you might want to try. See the tips and variations for many possible add-ins, decorating ideas, and some tips for chopping pecans. Heat the oven to 325 F. Lightly grease baking sheets or line with parchment paper or silicone baking mats. In a large mixing bowl with an electric mixer, beat the butter until creamy. Add the brown sugar and beat on high speed until light and fluffy. Stir in the vanilla. With the mixer on low speed, gradually add the flour. Scoop portions of cookie dough with a tablespoon or small cookie scoop and shape each into a ball. Arrange the cookie dough balls on the prepared baking sheets about 2 1/2 inches apart. Lightly grease the bottom of a glass or other small container with a flat bottom and dip it in granulated sugar, pourable brown sugar, or raw sugar. Press the bottom of the glass lightly on a cookie ball to flatten slightly. Redip the glass in sugar and repeat with the remaining balls of cookie dough. Bake the cookies in the preheated oven for 15 to 20 minutes, or until they are firm and lightly browned on the bottoms. Store the cooled cookies in an airtight container for up to 1 month, or freeze (undecorated) for up to 2 to 3 months. *If using unsalted butter, add 1/4 teaspoon of table salt or fine sea salt. If pecans are rancid, they will ruin your cookies. Always sniff or taste pecans before you use them. If you don't bake often, store any remaining pecans in an airtight container or zip-close plastic bag and refrigerate them for up to 4 months (depending on their freshness). Or freeze pecans (or any nuts) for up to 8 months. How to Chop Nuts: For best results, chop the pecans by hand with a sharp knife. If using a food processor, use quick pulses and don't overprocess or you'll end up with ground nuts or nut butter. Add 1/2 cup of Bits O' Brickle Bits or Heath Toffee Bits to the cookie dough with the pecans. 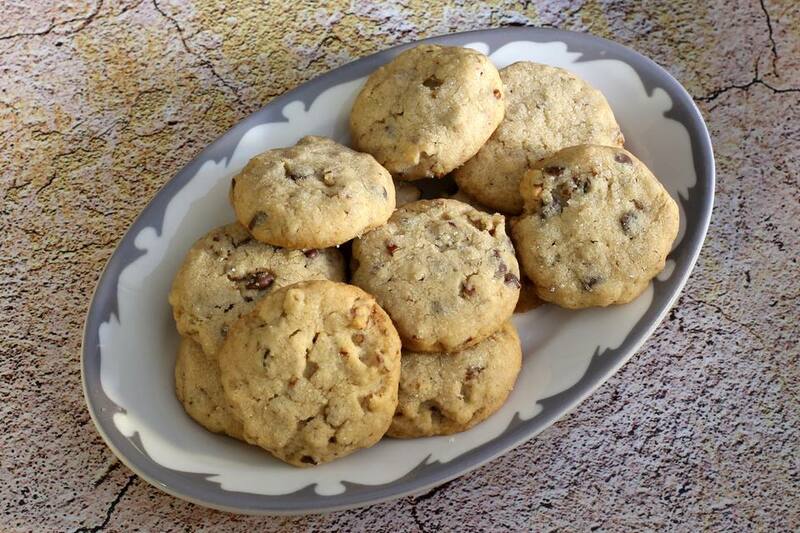 Add 1/2 cup of regular or mini semisweet chocolate chips to the cookie dough with the pecans. Replace the chopped pecans with chopped walnuts. Put 1 cup of semisweet chocolate chips and 2 teaspoons of vegetable shortening in a microwave-safe bowl. Microwave the chocolate for about 1 to 1 1/2 minutes, or until the chocolate has melted. Stir until smooth and blended. Dip the cooled cookies in melted chocolate to partially cover, or drizzle the melted chocolate over the cookies. Sift confectioners' sugar over the cooled cookies. Add 1/2 teaspoon of ground cinnamon to the batter with the flour for spiced pecan cookies.